In the quill embroidery leather goods are embroidered with split quills of upper tail feathers of peacocks and artistically crafted. The craft is more than 200 years old, but in Tirol just three companies still perform it. So unique handbags, wallets, leather pants or belts are created. Previously, such a belt gave information about the social status of the wearer. Today most brass bands use such belts in their traditional clothes. An embroidered pants can match the value of a small car today. About 500 years ago several mining areas were developed around the Gurgltal to win lead ore. Especially zinc and small amounts of silver were separated from the dead rock and transported into the valley in hard work. The work of the miners was very dangerous and the wet, cold and dust often meant that the miners were ill and often died young. However, for many families this work was the only way to earn a living. And so the miners went into the cleats over again. In the Knappenwelt Gurgltal in Tarrenz visitors can experience the harsh, but fascinating period of medieval mining itself. 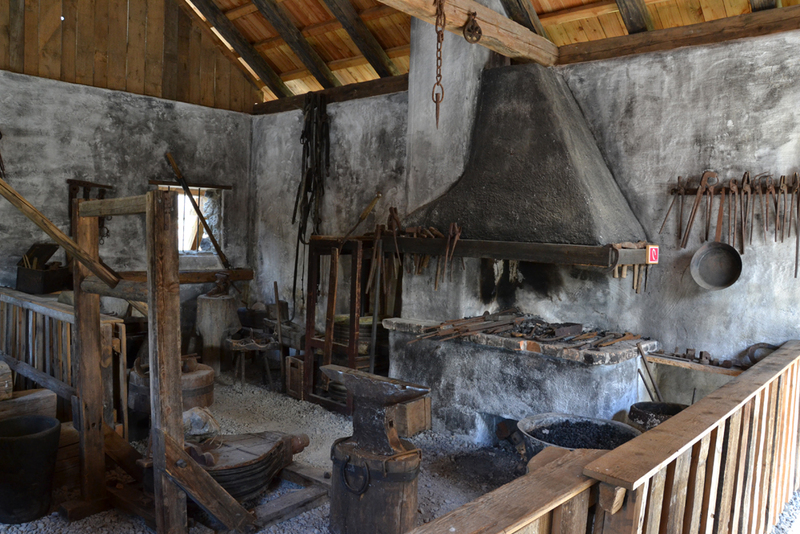 Pit house, Knappen House, crushers, screen stoves, scriptorium and forging facilities reflect the working field and the social life of the miners of yesteryear. In tunnels, the different mining techniques are presented and in the buildings guests are shown, what happened to the ore after it had left the tunnel. Some weeks ago we went to a family business in Umhausen, a village about 20 km away from our school. We wanted to find out about traditional sheep wool manufacturing. For about a hundred years Family Regensburger have made rugs and other products out of the Tyrolean Alpine sheep wool which is delivered by some hundred sheep farmers. The sheep graze on places up to 3.000 m in our region for more than half the year and are shorn twice a year. They bring about 5 kg of wool per year. The price for the wool currently lies at around 1 € per kilo. The wool is cleaned, sorted, washed and dried before it can be combed and then woven on different looms. In the workshop you can also buy products made of felt or sheep wool like blankets, hats or slippers. Of course, these old techniques are still performed in many housholds, especially by elder ladies. While many of them had to earn money that way in former times, it is nowadays only a hobby. But they still use traditional patterns to produce various items of clothing or decoration. Nevertheless, as these handicrafts are not taught at school any longer, the knowledge will vanish sooner or later!